For those precious few who follow this thing (and you are precious! ), just thought I'd let you know that we will be leaving Papua this week traveling back to the U.S. for a 7 month furlough. Plan is to be back in Papua in January 2012. We're taking the scenic route, by way of Singapore to let the docs do some poking and prodding on us. We'll be on the road for two weeks...so, blogging will probably take a back seat for a while...unless I get bored in an airport somewhere. 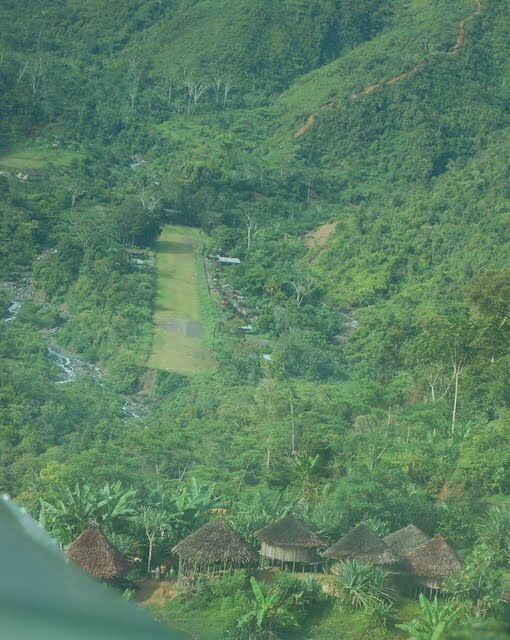 I'll leave you with a couple shots from my last flight in Papua...this is the approach into the tight mountain valley of Omban in the eastern highlands. Clouds and mountains mix for a 'judgement intensive' flight environment. These poor folks live right on the last ridge on final. for any sign of wind. Hey, I just found your blog and I think it's great! Do you have a summary somewhere that gives a little context to what you're doing in Papua? ...you know, I don't really have anything like that on the blog...send me an email at porterdude@gmail.com and I'll send you something that fills in the gaps.